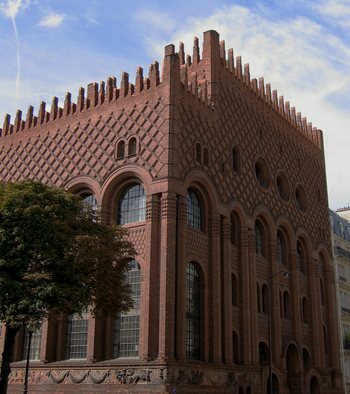 This is the Art and Archaeology Institute (avenue de l’Observatoire) associated with the University of Paris. We have noticed information here and there this summer, indicating that archaeological digs have been conducted in many, many places in Paris (including the Luxembourg Gardens). When the dig is completed, the site is just covered back over and whatever development was planned is implemented. With such a plethora of historic sites, I guess the French feel they can do this, but it disturbs our sense of historic preservation. At any rate, this building seems to be full of files – documentation of the digs, I presume? I also saw a reference to this building, in which the author calls it “hideously ugly.” It is unusual. The frieze you see along the bottom edge of the photo depicts ancient Greek and Roman scenes, with some kind of confllict in the middle where the two cultures meet. Bust of Baudelaire, in the Luxembourg Gardens. 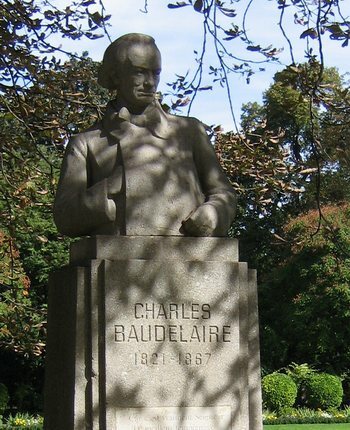 We also saw an impressive monument to Baudelaire in the Montparnasse Cemetery. Frieze on the Pharmacy school on the avenue de l’Observatoire. Yesterday’s long walk involved going through the entire Luxembourg Gardens, down the avenue de l’Observatoire, over to the Montparnasse Cemetery, several rounds through various parts of the massive cemetery, back through some little parks near Denfert-Rochereau, then back up through the grounds of the Observatory and up through the Luxembourg Gardens again. It was rush hour, but we managed to stay out of the traffic almost all of the time. While we were in the cemetery, which was VERY quiet, we heard sirens of emergency vehicles in the mid-distance for quite some time. I was beginning to be concerned that there had been some kind of disaster. But it turned out to be nothing more than a number of rush-hour auto accidents, I guess. There was nothing unusual in the news. But I’m not surprised there could be so many auto accidents in one rush hour in Paris. Ever since Parisians returned from vacation, the city has been plagued by those who are in an unbelievable hurry, and they think everyone else should make way for them. This happens both with drivers and with pedestrians. And I don’t think it is the majority of Parisians, just an obnoxious and very noticeable minority. They are like those people who still, against all logic and sense of hygiene, allow their dogs to poop on the sidewalk and then they don’t clean it up. Or take, for example, the man in the Luxembourg Gardens who instructed his girlfriend to stand on the grass (forbidden!) so he could take her photograph with just the right background. The fool did this right in front of two gendarmes! When the gendarmes told him that it was forbidden to stand on the grass, he shrugged his shoulders, gestured with his camera, and said, “I’m taking a picture!” (in French, of course). One of the gendarmes was angry at this insolence, but to avoid a confrontation he just turned his back on the stupid, selfish man. And when we were in the Grand Palais for that astounding antiques show, we saw a few people smoking, even though there are signs that clearly indicate that smoking is forbidden in the entire building. The outrageous belief that “the rules don’t apply to me” is a bit too noticeable in Paris . . . especially now that vacation time is over. By the way, two more important artists whose works were in the antiques show (and who I forgot to include the other day) were Utrillo and Soutine! The Observatory grounds, although shown as a huge park on the “Paris par Arrondissement” maps, are mostly not open to the public. One corner of the grounds is a public park (full of children playing during the hours before dinnertime), down on the boulevard Arago. The rest belongs to the Astrophysics Institute. Only during certain exhibitions or festivals are parts of the institute open to the public. Yesterday evening, we finally went to Brasserie Lipp (another Hemingway hangout) for the first time. We managed to get a corner table, even though we had not made a reservation. The food served is indeed authentically Alsatian, which surprised me a bit. Tom had a jarret de porc with tiny lentils and I had a fish called carrelet which was baked in a mushroom sauce and served with rice. The servers (all men, as usual) are dressed in very formal black-tie attire with long white aprons. Depending on the dish, the servers do some of the final preparation and presentation at a serving stand in the middle of the dining room. It is interesting to watch them. The food was fine, but I think German and Alsatian food is not my favorite. Tom’s pork was served with one very authentic sausage, which was very good. We even had dessert. Tom’s was a tarte tatin (apple pie) that was warm and exceptionally good, made with fresh apples NOT sliced thin the way the French do it, but made with chunks of apple the way the Germans do it. I had a crème caramel which was, as the French would say, very “correct,” and very French.